His analysis intelligently reviews the challenges involved in reducing acquisition costs. Later in this article I suggest an approach he doesn’t discuss but which is based on concepts he presents. Business Case: Requirements do not always match resources at program start. Execution: Once they begin, programs are often moved forward with too many unknowns. Neither of these will be new to experienced project managers. It’s just that the effects of “unknowns” and “scope creep” — the traditional nemeses of project managers — have impacts in the billions of dollars, given the size and complexity of these Federal programs. Experienced project managers know that managing risk and uncertainty are critical to project success. The reality is that the huge and expensive projects we’re talking about here have profound financial (and security) implications for U.S. citizens. We’re going over familiar ground here. Commentators and researchers on government acquisition reform have emphasized repeatedly the need to address these issues, most recently Raj Sharma and the Center for American Progress. We should already know what needs to be done. Or do we? Of the five acquisition issues listed above, the last — weaknesses in cost estimating — appears now to be the issue galvanizing public attention as the inevitable deficit steamroller bears down while grimly baring its cost-reduction fangs. The question now is not whether we will address the need to reduce acquisition costs but how we will actually accomplish the cost reduction. One choice we have is how intelligently we will make the changes. In my opinion this depends to a great extent on whether and how we focus on how knowledge is shared by those involved in acquisition processes. Another choice is for people to actually cooperate in making informed, intelligent decisions where costs and sacrifices are mutually understood, acknowledged, and shared. This approach assumes not only a willingness to change how the acquisition process currently operates; it also assumes that people know enough about costs, uncertainty, and risk to discuss them and their implications intelligently. But according to Dodaro’s model discussed above, the amount of risk and uncertainty in large programs is so high that making intelligent systemic decisions is hobbled. 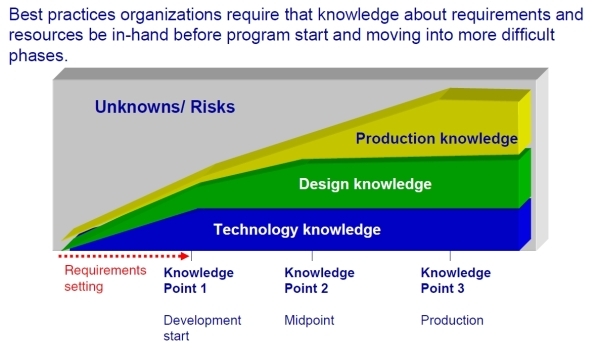 As the models above suggest, uncertainty and risk need to be exchanged for knowledge. As a solution, I suggest going beyond simply improving how we define program requirements to actually improving how experts and other stakeholders communicate and collaborate throughout the acquisition process. 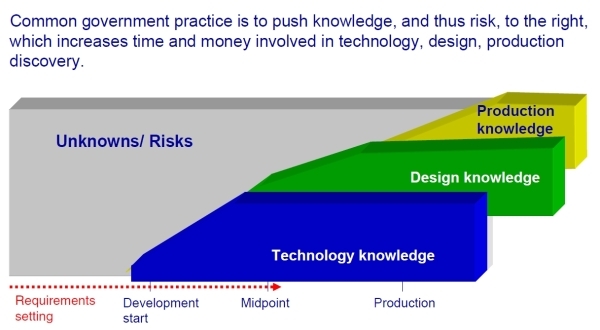 Are the right people communicating and sharing knowledge to enable a reduction in program risk? Are people with technical, design, and production knowledge relevant to a particular program able to identify each other and share information? Do organizational, cultural, professional, or legal barriers exist that actually prevent people from exchanging useful knowledge at key points in the acquisition process? Are procurement policies and practices as implemented encouraging communication or collaboration? Or are they preventing the sharing of information that might benefit all by reducing risk and improving the ability to make better cost estimates? Technology can help with such information sharing but cannot succeed on its own. This is true whether the emphasis is on capturing and sharing media that contain information, or making it easier for people to discover expertise and establish relationships with others. He might overestimate the cost of the task order to be on the “safe side. He might classify the task order as “firm fixed price” to control for uncertainty, which might in turn lead to bidders defensively “padding” their own estimates. He might delay the task order to engage in formal industry communications to seek guidance about price, thus increasing the time and cost of the acquisition process. He might just ignore the rules and call Jane anyway even though this risks official censure and possible contract protests down the road. Repeat scenarios like this thousands of times in a complex acquisition program where a myriad of uncertainties about cost, technique, and processes need to be addressed, and you begin to see how delays and extra costs add up. Consider also what happens if Joe doesn’t know that Jane has the answer and has to take the time to establish relationships with potential experts just to find out who can actually answer the right question. You begin to see where failing to establish open and extensive communication networks in advance of need can profoundly impact program costs dues to the cascading effects of uncertainty and risk. Again, technologies that support communication and collaboration can help, but they are not enough. Even if management encourages their use, failure to address and, where possible, remove the political, organizational, or policy barriers to open communication — as well as barriers caused by the “that’s not how we’ve done it in the past” excuse — will result in failure. If that happens, we’re back to the “brute force” approach to cost control: start by reducing available funding and let the chips fall where they may. Copyright (c) 2010 by Dennis D. McDonald. Dr. McDonald is an independent consultant in Alexandria Virginia. He can be reached via email at ddmcd@yahoo.com or via his office phone at 703-549-1030. His web site is located at /. Dec 2 Government Contract Award Announcements: The Soft Underbelly of "Government Transparency"